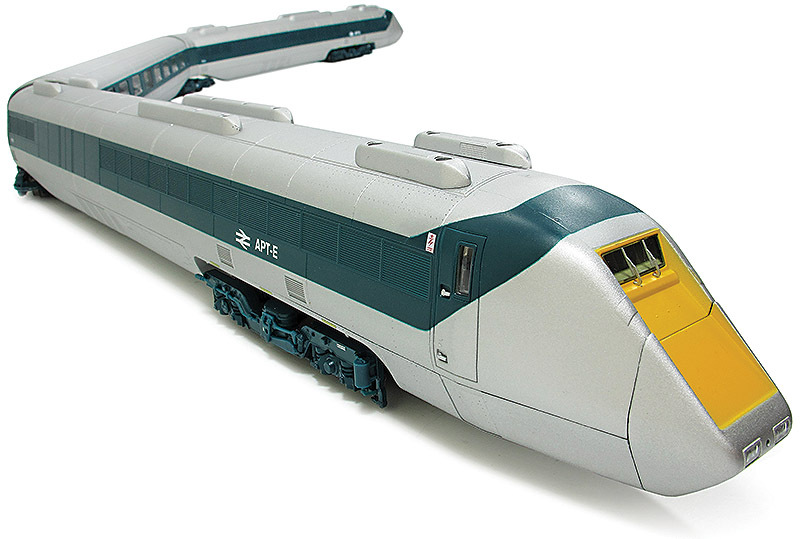 Revolution Trains announced the opening of expressions of interest in an N gauge model of the iconic APT-E at the International N Gauge Show (TINGS). Since Rapido Trains Inc produced their award-winning OO gauge model for the NRM we have been regularly asked if we would consider asking the NRM and Rapido if we could produce a model in N gauge. We are delighted that we have an outline agreement with the NRM and Rapido to produce the APT-E in N gauge. This in turn would result in a substantial donation to the NRM. The Advanced Passenger Train – Experimental, or APT-E, was designed to be a test bed for new ideas. It incorporated lightweight construction, high power/weight ratio, good aerodynamics, improved brake systems and an innovative tilt system that would allow high speed operation on existing curves while maintaining both safety and customer comfort. The train consisted of four units – two power cars and two intermediate cars. The power cars each contained five British Leyland turbines originally developed for use in long distance trucks. These turbines were originally rated at 300 bhp each, later increased to 350 bhp each. The turbines drove an alternator which provided power for two traction motors. One of the intermediate cars was fitted with a passenger compartment, the other was stuffed full of instrumentation and electrical gear to allow the travelling engineers to monitor the various systems on the train. A diesel generator fitted in both of the power cars provided accessory power to provide all of the electrical power needed for these instruments. The APT-E was tested extensively between June 1972 and April 1976 logging nearly 23,600 miles. On 10 August 1975, the APT-E achieved the British railway speed record of 152.3 MPH during trials on the Great Western Main Line. This record still stands for non-electrified rail travel in the UK. Exact specifications and price will not be available until we start the serious design work, though we expect both the specification and price to be similar to the OO gauge model (price £225). At this stage we are not asking for any money, just expressions of interest to establish whether there is sufficient demand to make the model. If you are interested please complete our expression of interest form on our website at revolutiontrains.com/apt-e.